Lowdown: The personal story of an American cargo ship attacked by Somali pirates. Nowadays, when we think piracy, we usually think along the lines of bit torrent. That, however, is the result of copyright industry brainwashing, as there is very little similarity between true high seas piracy and what people do in order to watch Game of Thrones. Captain Phillips demonstrates this difference quite vividly. Back in 2009, an American cargo ship sailing across the coast of Africa and ferrying mostly food and humanitarian aid to that continent was engaged by Somali pirates. 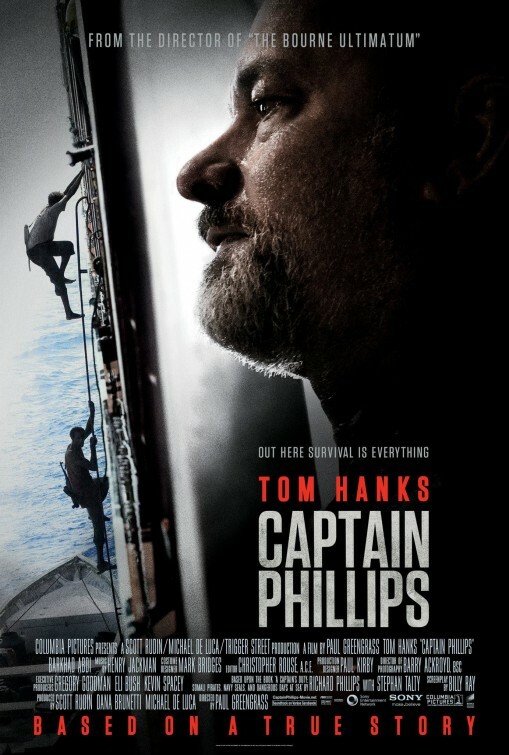 That American ship was captained by Richard Phillips (Tom Hanks), and the story of the movie bearing his name is alleged to be the true story of what happened back then: how the ship fought the pirates, what happened between the ship and the pirates, and how matters deteriorated to the point of using the full might of the American navy. Our story is told in a very intimate manner, the way Paul Greengrass movies usually are (shaking camera et al, as per Green Zone and Bourne Ultimatum); this time around I did not suffer much sea sickness, though. More so, I think the style helps in making this a personal story rather than the tale of naval engagement. At two hours and a quarter, Captain Phillips was thrilling throughout. What is even more interesting about the Captain Phillips story is that it does not cover the American side alone. We also see things through Somali eyes, enabling us to witness the human element on that side. While definitely a nice addition, this inclusion did see me raising some questions concerning the story’s authenticity: Richard Phillips, the author of the book on which this movie is based, was obviously absent from the Somali villages out of which the pirates came. One thing I did not find nice was the potential use of Captain Phillips as a tool for promoting American military might. As in, “look what could have happened to our poor captain if it wasn’t for the navy battleships, SEALs & Co”. Or, taken further, “let us invest more in our military so as to make sure no Captain Phillips incident ever happens again”. I would consider such conclusions being drawn a rather tragic turn of events; it would make much more sense to invest in improving the state of Africa than to seal oneself in a military fortress. And it would definitely make America much more popular than it currently is. There one more thing I want to say, and that is: Tom Hanks. If, like me, you were wondering whether the guy is past it, then wonder no more. Hanks’ performance is just as good as the one he gave us in Cast Away. Best scene: The mechanical efficiency with which the SEALs execute their plan of attack, and the human cost of that attack. I don't want to say too much here, but the operation's depiction represents excellent cinema work. Overall: Potential interpretation issues aside, Captain Phillips is not a film for the glorification of America but rather a film that tells stories of heroism in authentic and tragic conditions. It does so well enough to dwell in that nice chasm between 3.5 to 4 out of 5 crabs.